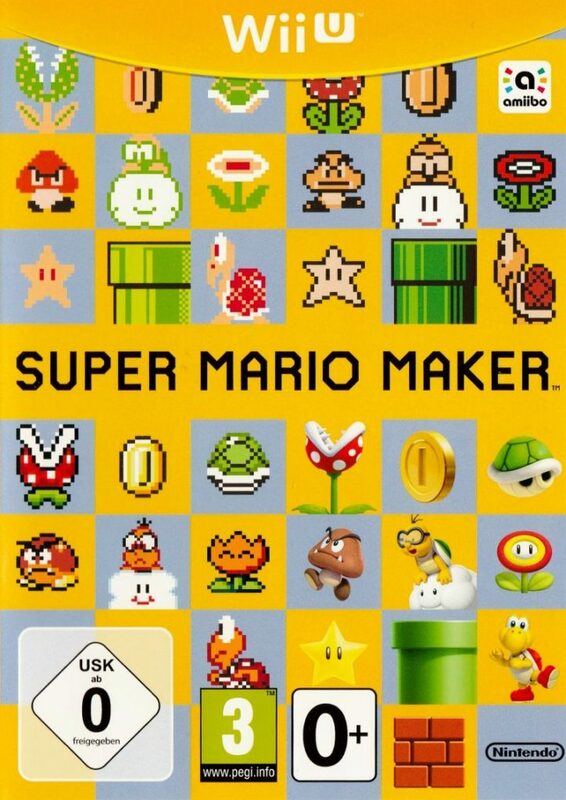 Super Mario Maker is an exciting game which gives you the opportunity to build your own Mario levels. In my experience, creative sorts of people often seem to be drawn towards video games and this is a fantastic opportunity for gamers to put those creative skills to use. You might think that that sounds more like a tool than a game, but you’re given access to millions of levels created by other players (which you can play at your leisure) and there are also a large number of pre-made levels already in the game, so there’s still a lot of fun to be had even if you don’t have many creative level ideas. One feature which I found especially appealing was the Mystery Mushroom. This is a power-up which transforms Mario into another character and there are a huge number of characters available through the Mystery Mushroom. These can be unlocked by winning other players’ levels online (which provides a good excuse to keep playing) or by scanning compatible Amiibo. A few of my personal favourite Mystery Mushroom characters included Arcade Bunny (from Nintendo Badge Arcade), Foreman Spike (from Wrecking Crew), Nikki (from Nintendo Letter Box), Master Belch (from EarthBound), Donkey Kong Jr. and Babymetal (yes, the band.) There are a lot of pretty obscure characters in there and as a huge Nintendo fan I was very excited to see them. They even come with voice clips, sound effects and music from their own games! The addition of all these extra characters really opens the doors for creative players who want to build things which aren’t based around Mario. I made a level featuring Waluigi which was supposed to be his house – I had fun making it very weird and creepy. I made a level with Lucina (from Fire Emblem: Awakening) which depicted an event in the character’s life. I recreated a level from Donkey Kong Country and included Donkey and Diddy Kong in it and I made several other levels using the Myster Mushroom too. It’s so much fun and I saw some amazing creations by other players as well. While the level editor is a really great tool, I do feel that it was limited in some ways. The biggest problem for me was the fact that levels couldn’t be very tall. There were several times when I was building something but then had to change my plans because the screen wouldn’t go any higher. Another issue was that if you wanted lava or water, you had to go for a castle or underwater level, you couldn’t put either of them in any other type of level. There were a few enemies which felt a little conspicuous by their absence too, such as Chargin’ Chuck. When it comes to playing other people’s creations, I really enjoyed playing things that my friends had made. I also enjoyed some of the levels by strangers that I played. How it works is that you choose a difficulty and then you have to win a set number of levels with 100 lives. If you lose all your lives, it’s game over. This may sound easy, but the game’s algorithm determines how hard a level is based on how well other players did in it and some of them are really tough. Easy, Normal and even Hard Mode were okay for me, but winning Expert Mode was extremely difficult. I don’t know if I’ll ever win the Super Expert Mode that was later added in an update. The reason that these levels are so hard, is because they’ve just been made in the most frustrating ways possible. They’re full of traps which will definitely kill you if you don’t know they’re there and most of the levels are terrible (in the harder modes, that is.) Some hard levels have been really skilfully crafted in order to provide a tough but rewarding challenge, but most of them seem to have been created out of the desire to cause frustration and nothing else. To be honest, while there are some amazing pieces of work out there, a lot of the levels are bad in all modes. I mean they were probably made by kids and I admire the creative energy that went into them, but that doesn’t make them fun to play. What frustrates me is that you have to play these levels in order to get all the Mystery Mushroom characters. I probably won’t be able to unlock them all because of this. Still, the low quality of user created content isn’t really a mark against this game. You’ll have lots of fun playing the good online levels and creating your own content. Swapping levels with friends is one of the most fun things you can do in Super Mario Maker. There are quite a few pre-made levels in the game too and if you play and win them, you then have the option to edit them. These were a minor and unimportant feature to me, but maybe some players will enjoy them. Overall, this was a fantastic game and one of the best in the Mario series. This entry was posted in Video Games. Bookmark the permalink.